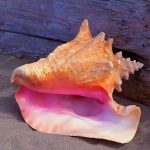 In a research article published today by Science Robotics, work by Massachusetts Institute of Technology’s (MIT’s) Mediated Matter lab in Cambridge describes a 3D printing method for the construction of large structures. 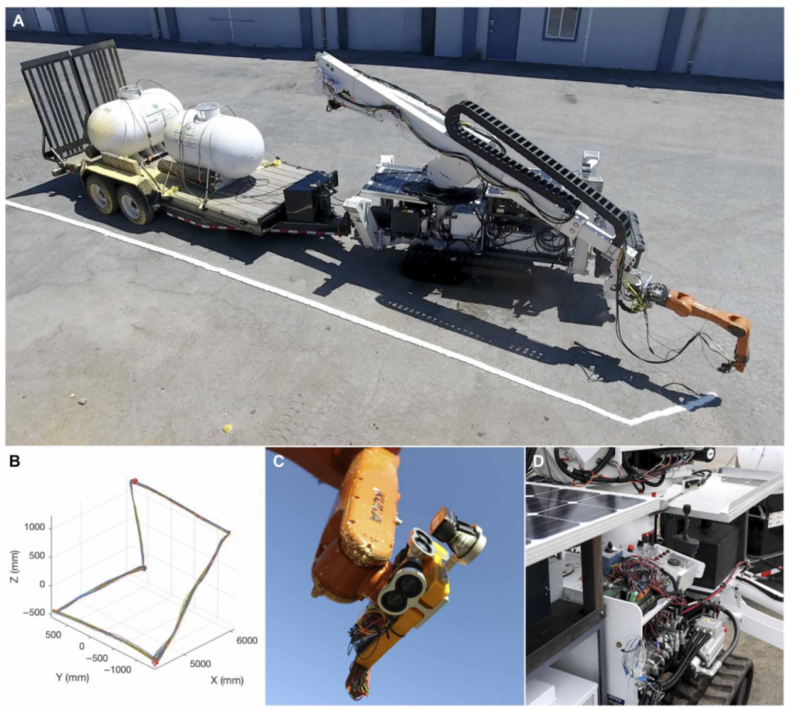 A robot arm, mounted on a vehicle, controls a nozzle through which an expanding foam is sprayed. With repeated passes, a series of layers of the foam are built up. As the foam expands, it sets and the cavity created by building two parallel walls can then be filled with concrete. The case study shows how an architectural-scale hemi-ellipsodial dome section was 3D printed. 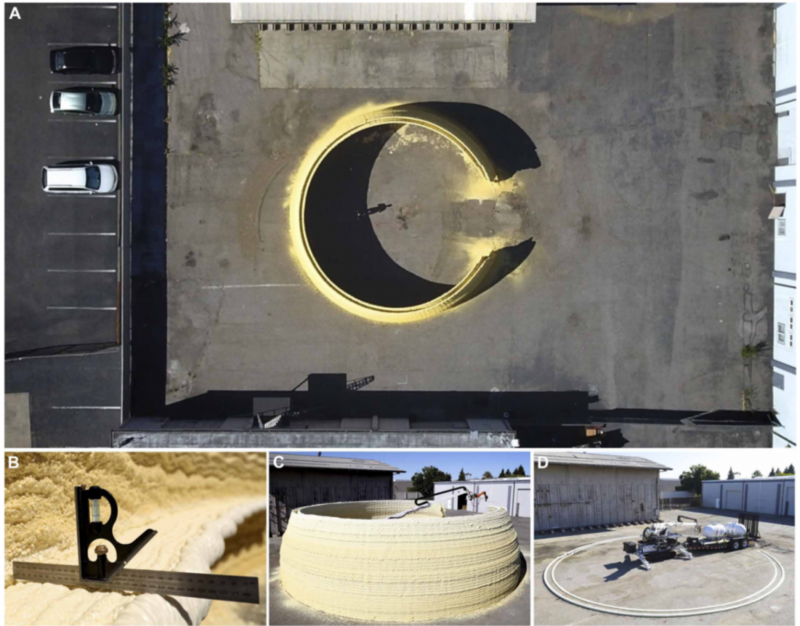 A video shows the DCP 3D printer successfully printing a 14.6-m-diameter, 3.7-m-tall open dome formwork structure, that the researchers say was completed in less than 13.5 hours. Science Mag say this is the, “world’s biggest botmade building.” Able to extend 10 meters, the DCP has a load capacity of 158 kg. Reportedly, the MIT team has received interest from Google, NASA and even a private individual who was interested to learn if the DCP could be used to create an underground basket ball court. One of the key features that enables the DCP to operate in a precise manner is the inclusion of a laser on of the tip of the robot arm. The laser measures the arms position accurately and feeds back this information to allow for automatic adjustments to be made, and keeps the print run stable. 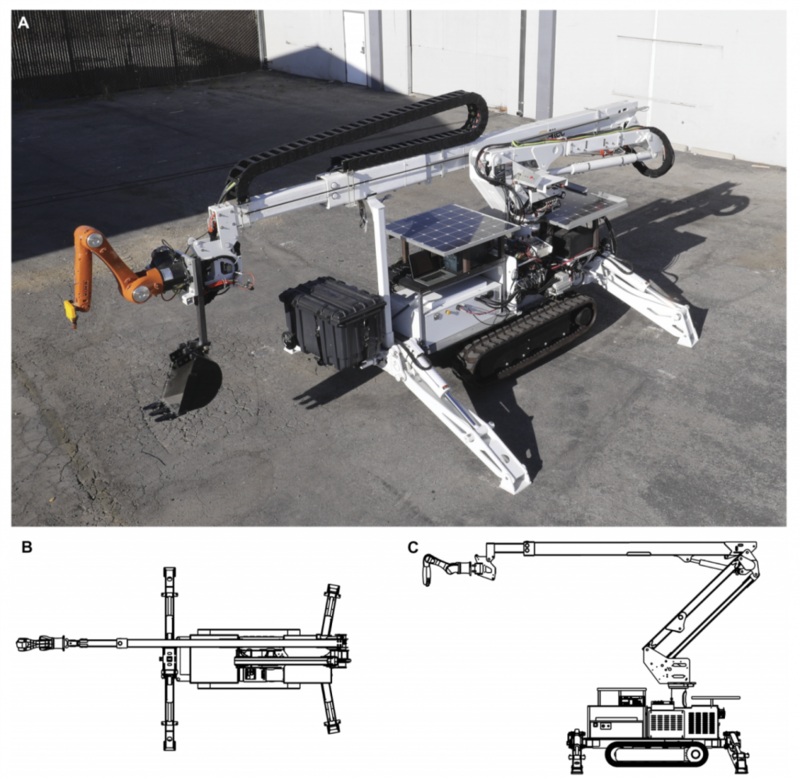 The DCP, “consists of combined hydraulic and electric robotic arms in a micro-macro manipulator configuration, mounted on a tracked mobile base.” Further details explain how the concept is based, “around a mobile compound robotic arm system composed of a large, 4-DOF hydraulic arm with a smaller, 6-DOF electric arm attached at its endpoint.” This set-up is similar in design to a human shoulder and hand say the researchers. The article, “Toward site-specific and self-sufficient robotic fabrication on architectural scales” by Steven J. Keating, Julian C. Leland, Levi Cai and Neri Oxman can be read here.